Congratulations Aidan on his Junior Black Belt! 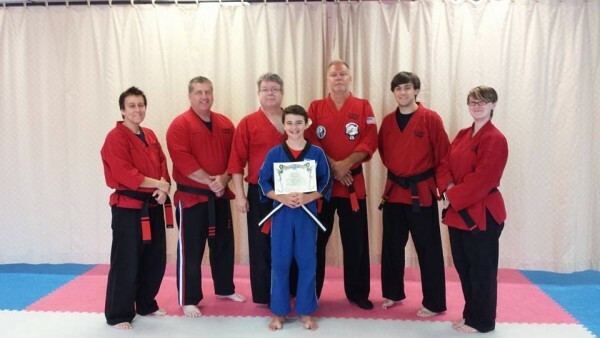 Please join us in congratulating Aidan on his Junior Black Belt. The junior black belt test is a private test between the student and the instructors and the events that occur at the test remain between the attendees. 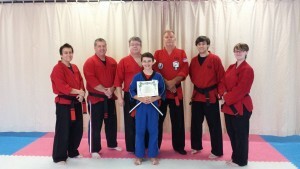 Aidan performed in a distinctive manner all the skills and knowledge needed to receive the rank of Junior Black Belt. Along with being a talented individual, Aidan is a kind young man of age 12 that is eager to learn and progress toward his Adult Black Belt. This young man is persistent, humble, dedicated, and always smiling which many of our younger students look up to. He has become a part of an elite club of students who have reached this level. We have high hopes that he will one day receive his Adult Black Belt. This article was posted in Belt Graduation. Bookmark the permalink. Follow comments with the RSS feed for this post.Post a Comment or leave a trackback: Trackback URL. « Join CT Kenpo at the Big E!